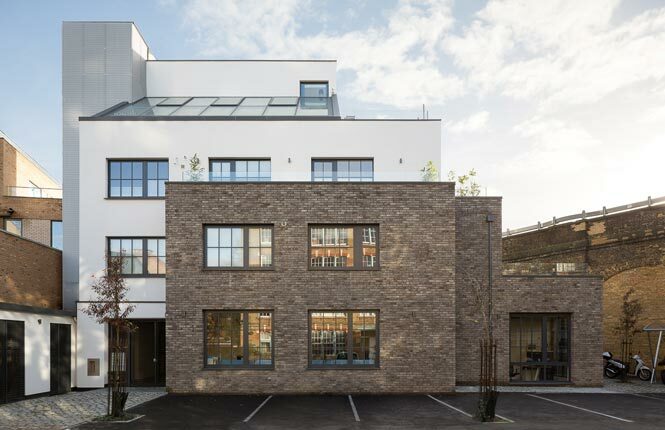 This mixed use development, comprising two ground floor commercial units, seven residential flats and a standalone studio house, is built within the curtilage of the Neckinger Mills site, a Grade II Listed 19th Century former tannery mill. 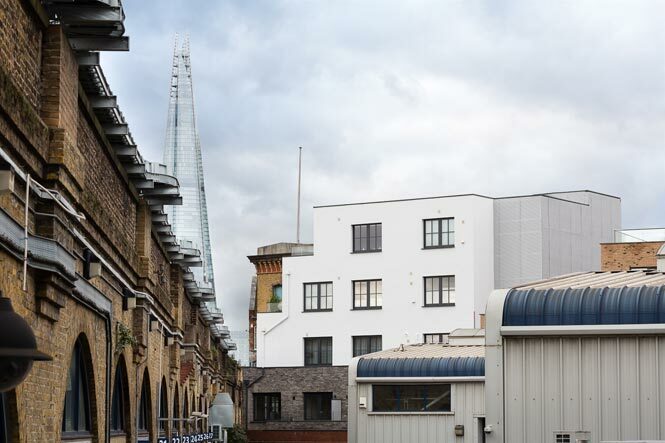 The building represents the last surviving Victorian mill building in the Bermondsey area following the Blitz. Tanning pits were originally located at the site to the rear of the mill adjacent to the Greenwich railway viaduct, constructed in 1840, and later developed with a mid-20th Century prefabricated ‘Atcost’ shed used as a commercial workshop, which fell into disrepair. 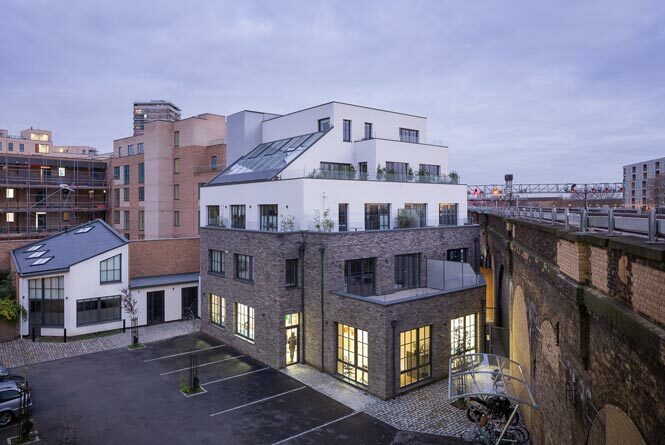 The former warehouse was converted in the early 1980’s into some of the first warehouse ‘loft’ apartments in London providing large open plan living spaces within an existing industrial building along with studio accommodation where Mark Fairhurst Architects was first established. In 1994 the Jubilee Extension Underground line was constructed 26 metres directly under the site creating another significant design parameter for the new development along with the redevelopment of the adjacent former Drill Hall site. 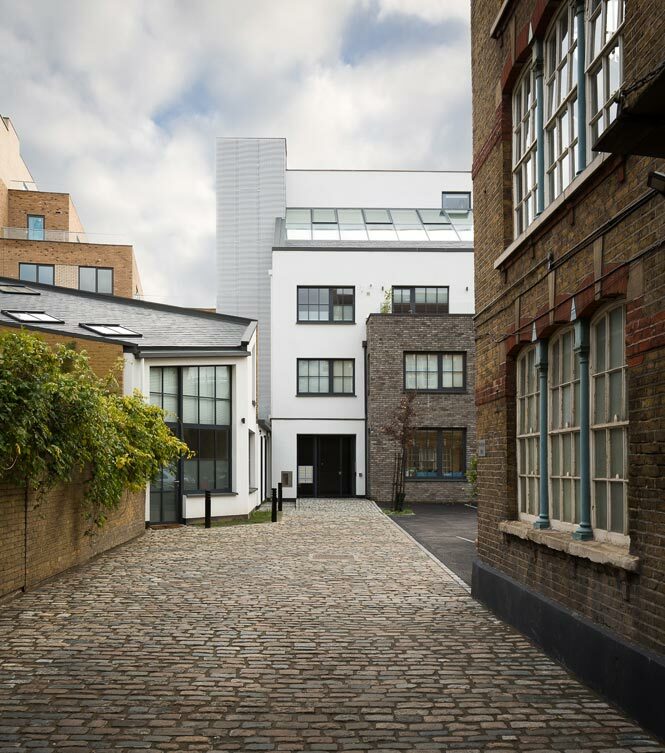 The building is approached via a gated cobbled courtyard providing access and parking to the building and existing ‘warehouse’ apartments and commercial studios. The massing is stepped backed at each floor creating terraces for the apartments and reducing the visual impact on the existing tenants preventing overlooking. 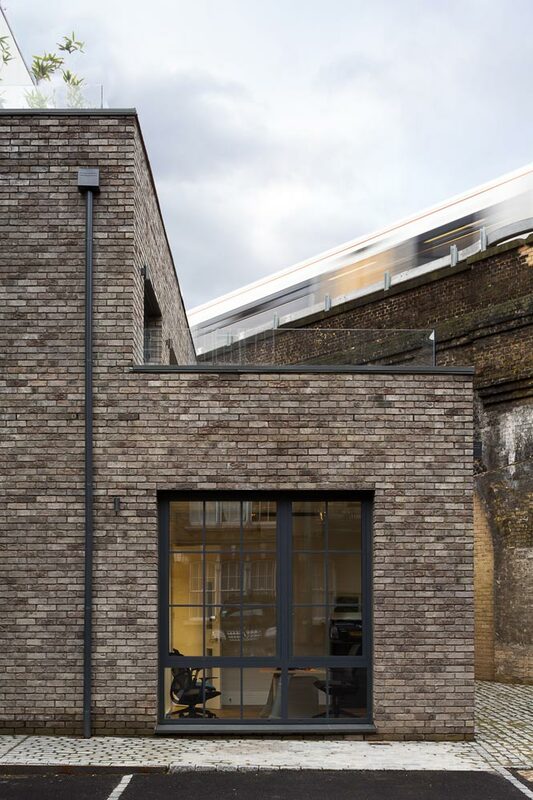 The large double glazed aluminium windows, with subdivisions, mirror the existing cast iron Victorian warehouse windows; rustic dark grey bricks, render and aluminium mesh cladding accentuate the new massing. The apartments are designed to Level 4 of the Code for Sustainable Homes and include ventilation heat recovery units along with high levels of thermal insulation, acoustic attenuation and communal cycle parking. The commercial offices comply with ‘Excellent’ in the BREEAM sustainability ratings. 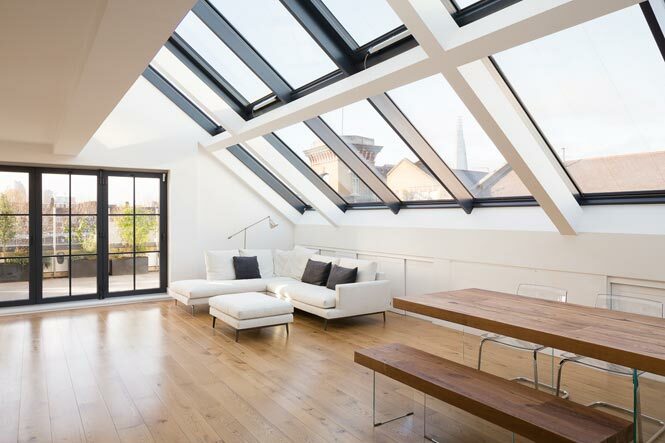 Mark Fairhurst Architects worked with developer and contractor Kuropatwa Ltd., in improving the scheme design, maximising the potential of the new scheme and coordinating the technical design with contractor and design team.